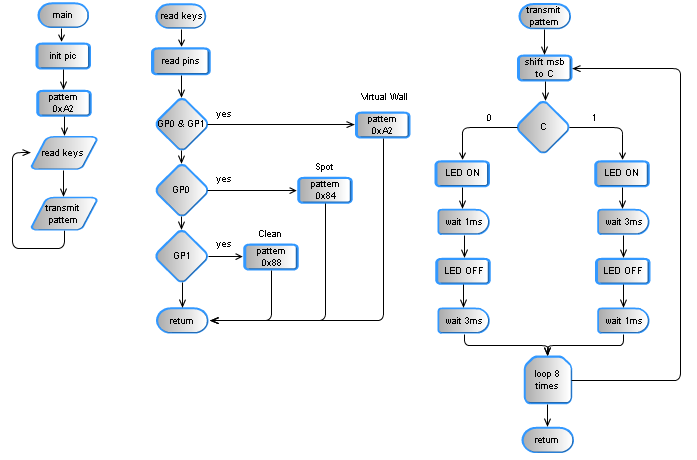 Small Virtual Wall for iRobot Roomba | Enide! The Virtual Wall is a circuit to mimic the behaviour of the iRobot Virtual Wall/Lighthouse, provided with the robot. It produces the same infrared pattern and the robot sees it as another virtual wall, blocking its path, while vacuuming. This circuit was built mostly using SMD components to reduce its size, nearly to the size of a 9V battery (PP3/6F22/6LF22/etc). After examining the original virtual wall, with a webcam, I was able to see that it emits infrared light from its top round transparent ring and from a small hole above the switches. The light coming from the top ring prevents the robot from colliding with the virtual wall, if it comes from its sides or from behind. The front hole emits light as a beam. This beam of light is directional and stops at the nearest obstacle, probably a real wall, preventing the robot from crossing it to the other side. The pattern emitted by the virtual wall is a form of PWM, modulated with a carrier frequency around 38KHz. Below is a picture of the pattern captured using a TSOP1238 and an oscilloscope. So the byte being emitted is 0xA2 or 0b10100010. The pattern repeats itself after a few tenths of milliseconds later. A circuit to emit a similar pattern will need to output the same 0xA2 pattern, generate the 38KHz carrier frequency and mix the two together. Using a PIC microcontroller it is possible to output the pattern and generate the carrier frequency. Mixing is accomplished by connecting the LED between the PWM output and the carrier output. A great solution is to use the PIC's master clock oscillator output to produce the carrier frequency. This is the solution proposed by the circuit below. 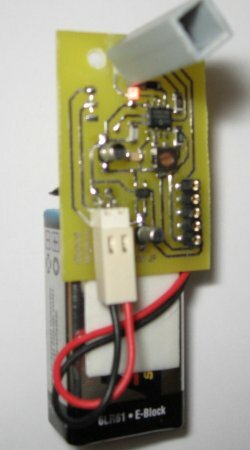 The PIC clock runs at 160KHz (FOSC) using an RC oscillator and the carrier frequency is available on CLKOUT pin as FOSC/4, at 40KHz. 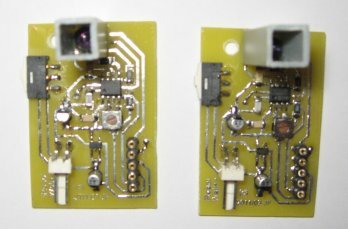 From left to right we see the main switch, the power supply based on a MIC5205-5, 5V/150mA regulator, the microcontroller, two LEDs, one emitting visible light and an infrared one. Connected to the microcontroller's pin 2 (CLKIN) are R1 and C6 that form the RC pair for the PIC oscillator. There's also a 5 pin header to connect the programmer (an ICD2 or another compatible one). Click the image to enlarge. The power supply's MIC5205 is a low dropout voltage, low noise, low quiescent current, regulator very good for battery powered circuits and powerful enough to deliver 150mA. The circuit consumes 3.5mA on average and the IR LED peak current is 25mA mostly because the PIC cannot drive more than 25mA on its pins. The input voltage should be between 5.2V and 16V and I suggest a 9V battery to which you may hold the circuit using velcro or any double sided sticky tape. As referred above, the PIC's master clock should be adjusted to FOSC=160KHz using R1. Connecting a frequency counter to pin 3 (CLKOUT) and adjusting R6 until 39KHz or 40KHz are displayed. This adjustment is not critical. The visible LED should be a high brightness model because it is driven with less than 1 mA. 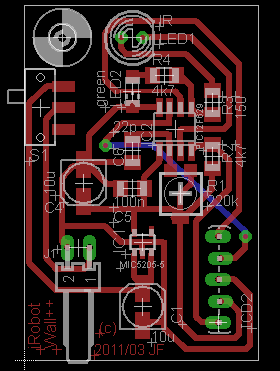 The PCB and Schematic were created using Eagle from Cadsoft. 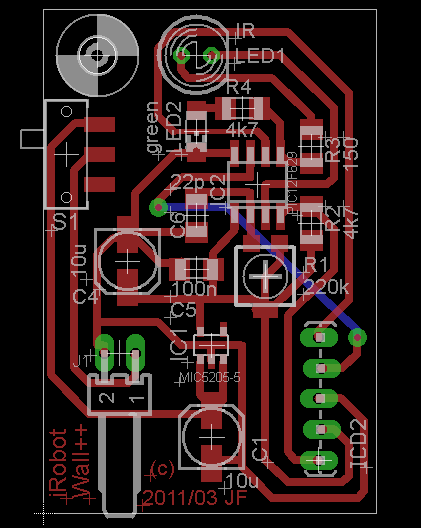 The PCB is about the same width as a 9V battery so it may be attached/glued/velcro'd to it. The blue line (replace with a wire jumper) and the ICD2 connector are only required for for programming the microcontroller. There's no need to add them to the PCB if the PIC was previously programmed. Both tracks and silk screen are available for download in two separate PDF files. Both files have mirror images suitable for photographic or toner transfer methods. This is my first attempt to write an assembly program on my own. It uses 89 bytes of FLASH and 8 bytes of RAM! There are no interrupts and all timings for the PWM are created by counting the instructions' time. The PWM routine gets the pattern byte 0xA2 and rotates it through the C flag. Then the correct bit pattern (see above) is produced, wating the correct amount of time and another bit is shifted through C. The process repeats itself 8 times, for each bit of the pattern byte. While on Spot or Clean pattern, breaking/releasing the connection to ground, stops the IR emission. When breaking/releasing the connection to ground of both pins simultaneously, the circuit will keep emitting the virtual wall pattern. There are other patterns emitted by the docking/charging station, their job is to let the robot position itself in line with the front side of the dock and recharge automatically. The firmware for pic12F629 is available for download below. After programming the PIC, the master clock needs to be adjusted to 160KHz. Then start your irobot vacuum cleaner and place the circuit board near its IR ring. The robot should move away from the circuit as if it was an original virtual wall.